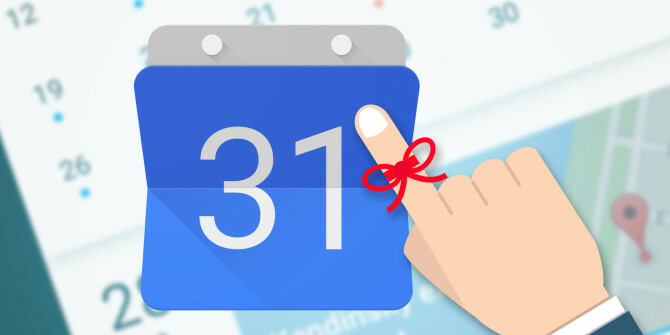 Click here for access to our new Google Calendar! Sync up the important dates for your child and school. Happy New Years! I hope everyone had a wonderful holiday. I can’t believe that half of the year is already completed. We are kicking it into high gear for the rest of the year. I want to remind you that our Panther Prowl Walk-A-Thon is our school fundraiser for the year. We hope to raise over $20,000 to use to purchase technology for our school. Our goal is to buy enough laptop computers for each student in the school. The Walk-A-Thon will be held on Friday, January 25. Pre-K, kindergarten, and fourth graders will walk from 8:30 – 9:30. ESE, first, and third grade students will participate from 9:30 – 10:30. Second and fifth graders will walk from 10:30 – 11:30. We are looking for volunteers to help out this day. Please sign up on https://www.signupgenius.com/go/10C0D45A9AA2CA1FD0-walkathon. Prizes will be awarded for the top money collectors. Thank you so much for your support. Students in grades 3, 4, and 5 are working hard on their Math Fact Fluency Challenge. In order for students to become more efficient problem solvers, they must know their multiplication and division facts. After students eat breakfast in the cafeteria, several laptop computers have been set up for them to complete an online fact mastery challenge. They will work their way through math facts 0 – 12, and can take one test a day. This will be on a first come, first serve basis for computer access. Students must earn 100% to move on to the next number challenge. They will be given special panther cash for each fact set mastered. Computer access will be stopped at 7:30, so students can get to class on time. Please help us encourage the students to participate in this and to learn their facts. Thank you so much for all you do for our students. If there is anything I can do to be of assistance, please let me know. The fun continues that evening with a live Music Fest from the stage at the Hunter’s Green Community Park. There will be bands performing from various genres, food trucks, silent auction tent, kid’s activities and lots more! Register the whole family, we have something for everyone! Register by 1/28 to guarantee your T-Shirt size. Bands, Food Trucks, Silent Auction Tent, Kids Activities and more! 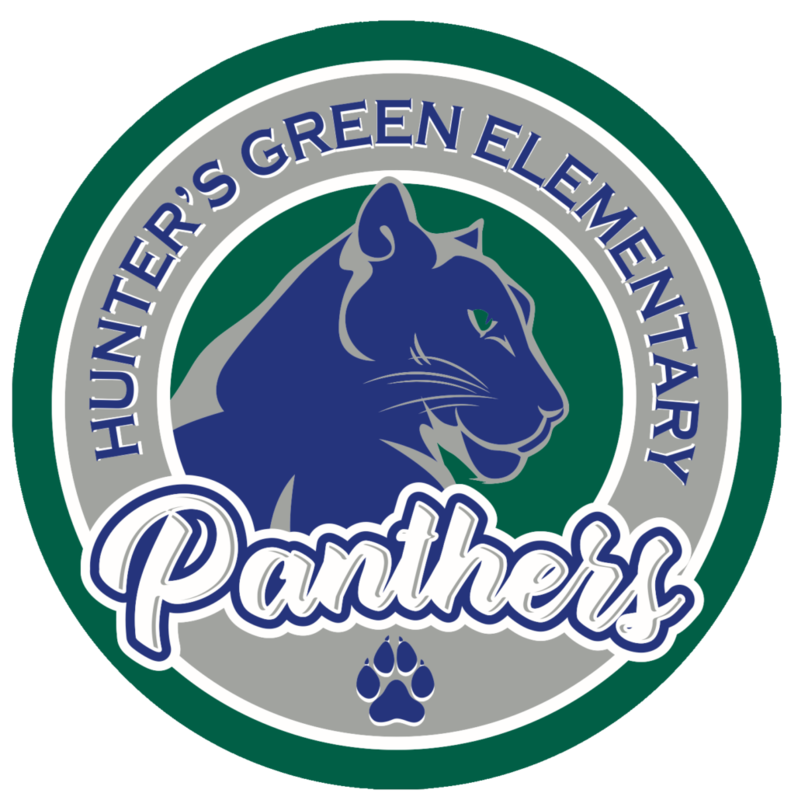 The Hunter’s Green Food Drive kicks of on January 28th and runs until Feb. 1st. The local food banks are depleted from the holidays and we want to help restock them! Bring your donations of canned or boxed nonperishable food to the media center, and place it in the box that’s the color of your school team – red, yellow, green, purple, or blue. Each item you bring earns a point for your team AND helps families in our community. Every can and box of food makes a difference! 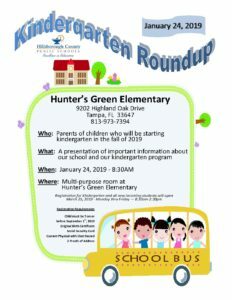 The Hunter’s Green Kindergarten Round Up will be held on January 24 at 8:30am. This is a great opportunity for incoming Kindergarten parents and students to learn about our school and how to register. Please help spread the word to your friends and neighbors! SLAM is a reading program for all Hillsborough County K-12 students which promotes reading a collection of books nominated for state awards. Students were encouraged to read these books and respond to them through artistic expression. Today, students in grades K-5 submitted their 2D Art and/or Video Creative Expressions to their teachers for our SLAM Showcase. Student projects will be displayed in their grade levels this week so that students can choose their favorites. Top projects from each grade level, or “favorites,” will then be displayed in the Media Center the week of Jan. 28-Feb 1st for our School SLAM celebration on Jan. 31st. The top projects for the school will be on display at the celebration and those chosen to represent our school will be invited to the district SLAM Showcase at the Tampa Convention Center on Tuesday, March 5th. These student creators will also get to see award-winning authors and storytellers at the district SLAM. Mark your calendars, Panthers. 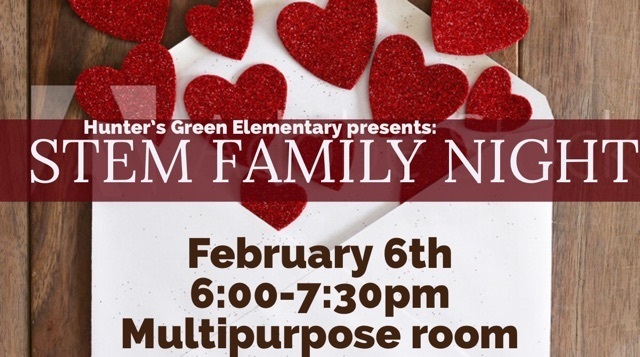 The STEM Family Night is back February 6th in the Multipurpose room and Cafeteria from 6:00-7:30 pm! Come join us after the FSA Informational Meeting (from 5:00-6:00 pm) for some STEMtastic fun. Play student-created cardboard arcade games, challenge yourself with various grade level STEM activities with your favorite teachers, and try your luck at winning one of four amazing STEM prizes! More information will be coming home soon. If you have any questions or would like to assist with this event, please email Amanda.Glover@sdhc.k12.fl.us. All 3rd, 4th and 5th grade students in the state of Florida are required to take the Florida Standards Assessment (FSA). We want to make sure parents and students understand the format and have the most up to date information available for this important assessment. We will be hosting an information session about the upcoming FSA on Wednesday, Feb 6th at 5:00pm. We encourage all parents and students in grades 3-5 to attend. This session will immediately be followed by our STEM night. The blended PEEPS/VPK program will offer a high-quality prekindergarten experience to children eligible for VPK. The program blends 9 VPK students with Exceptional Student Education (PEEPS) students. Each classroom will have a certified teacher who is qualified to meet the needs of young children, with and without special needs. VPK education standards, developmentally appropriate curriculum and supports children’s individual needs will be integrated throughout the school day. 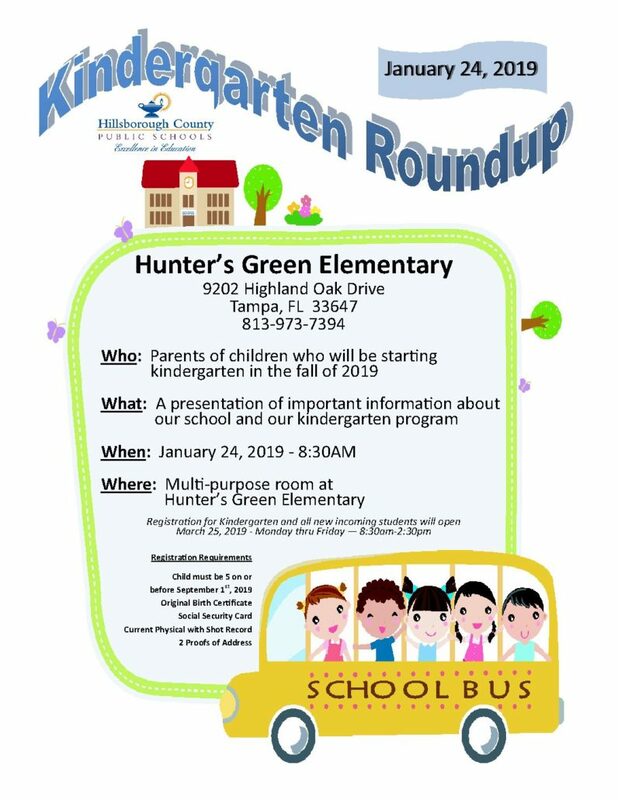 Eligible children must turn four years old between February 2, 2018 and September 1, 2019, and may not have previously enrolled in a Kindergarten or VPK program. VPK seats will be awarded through a “prioritized” waitlist. Each family will be assigned points based on specific criteria. VPK seats will be assigned based on points AND the order in which the family signed up. Families that are awarded a seat in the VPK program will be notified no later than March 1, 2019. To put your child’s name on the wait list, stop by the Hunter’s Green Elementary front office from 8:00 am – 2:00 pm and ask for Terri Talebi. For any questions, please call 813-973-7394 ext. 242 or email: Terri.Talebi@sdhc.k12.fl.us or you can call the VPK Hotline at 813-272-4840. Tours are scheduled by appointment only. Please call 813-973-7394 to book a tour of our campus.